Arthritis of the thumb typically affects the joint at the base of the thumb where your thumb attaches to your wrist. 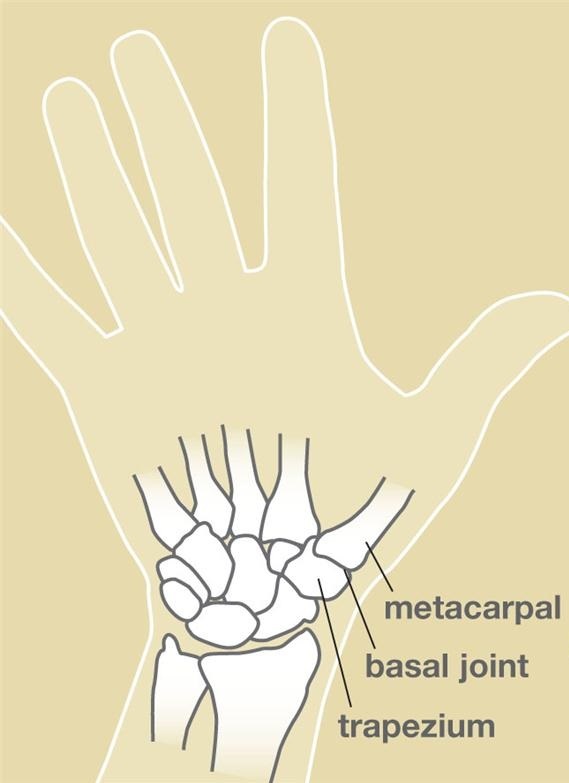 It is the joint between the metacarpal and the trapezium. It is a common disorder in those over 40 years of age and affects women more often than men. As many as 25% of women may develop thedisorder. There are many types of arthritis, but the most common form is osteoarthritis (degenerative or “wear and tear” arthritis). Osteoarthritis is a process of the smooth cartilage surfaces on the end of bones wearing away causing one to have bone rubbing on bone. Arthritis at the base of the thumb is sometimes related to prior injuries or fractures, but the majority of the time it develops on its own. Other names for this disorder include carpometacarpal (CMC) arthritis and basal joint arthritis. Thumb arthritis can cause pain, swelling, bony deformity, and loss of strength/motion when using the thumb. Common complaints include difficulty opening jars, turning keys, and opening door knobs. Many patients have had to give up their knitting and crochet hobbies because of pain. Clinical history, physical exam, and x-rays will typically allow your surgeon to make the diagnosis. 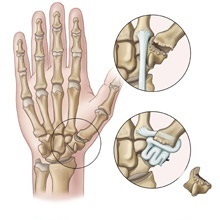 Arthritis of the base of thumb is initially treated conservatively with oral anti-inflammatory medications and braces which support the thumb and take some stress off of the diseased joint. Cortisone (anti-inflammatory medicine) injections can also be done into the diseased joint to provide pain relief. This pain relief is typically temporary but can last as long as a few months. If your pain is not sufficiently relieved with conservative measures, surgical treatment may be indicated. Surgery for arthritis at the base of the thumb is a very common procedure and has a high success rate. It is performed on an outpatient basis at a surgical center or hospital and takes about one hour. The technique used can vary from patient to patient depending on the specific problem. You and your surgeon will discuss the specifics of your operation during your clinic visit. The most common procedure includes removing a bone from your wrist in order to eliminate the “bone on bone” grinding. A tendon from your forearm is used in order to fill in the space left by that bone and to create a bumper. You will wear a cast after surgery for about one month and then transition to a thumb splint. Hand therapy is initiated at this point and usually lasts 1-2 months. It can take 3-6 months to fully recover from the operation and get the strength back in your thumb.